The brain & the heart behind the successful management of AthenStyle..
She only wears shoes in emergencies, feeling much better in her Havaianas. She is relaxed still restless, and counts on her team. She doesn’t look like a business manager or a lawyer, but Sofia Lizzio is all the above and more. In collaboration with Giorgio Guidi, Italian artist and designer, and her business partner Chris they launched an innovative hospitality experience where friends and like minded travellers come together under the roof of a common carefree philosophy and bohemian finesse, where guests are encouraged to spend more time in the common areas rather than in the loneliness of their room. Lounge, basement, Rooftop Bar & Restaurant with unrivaled views are the means by which they imported this new hipster hospitality logic to the Mediterranean. For luxury is no longer showing off expensive accessories or opening a golden handle room-door, but having the time to travel and the energy to share unforgettable experiences, see why Sofia has been invited as a speaker to the World Hostel Conference 2012 and sits in the Europe Famous Hostels Executive Board. I was born and raised in Italy, but Greece has always been my second home my mum being Greek and my dad Italian. This mediterranean mix has created a very lively and energetic Sofia that started traveling very early. Discovering the world, while meeting people and learning languages has been a key to success, Australia to South America, NYC to Brazil, Europe to Asia… And much more to come.. I speak Italian and Greek obviously, English, Spanish and Portuguese, French and a bit of German. At the age of 31, I have already had quite a few life changing experiences. I am a qualified lawyer, have studied at Bocconi University of Milan and haveworked as a corporate lawyer in Clifford Chance law firm mainly as a consultant toreal estate funds. This has led me to the property developmentmarket, which together with my passion for travels has had as a result mycareer change into hostel set up and management. Ten years ago I founded together with Chris our first hostel in Athens: Soph & Chris Northern Backpackers which during the Olympic Games Athens 2004 was the hot spot of athletes families and Olympic volunteers. Since then Chris and I have never missed a hostel conference, meeting or party. Many times I have attended conference with the whole family, and we are quite famous in the hostel market for partying all together! 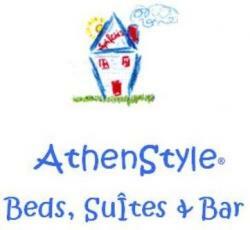 A few years later we founded AthenStyle, in the heart of the city and it has been a top rated hostel since we opened, featuring a famous rooftop Bar with Acropolis views.This year we have expanded the terrace to include a rooftop restaurant as well. We have years of experience leading the industry in Athens, are recommended by most websites and travel guides and are a proud member of the Europe Famous Hostels. Our ideal is to offer hotel quality services in a hostel atmosphere to approx 100 daily guests in Athens. The economic crisis has not scared me, competition only makes us better. New chances and new challenges are still to come and new destinations and top quality hostels to becreated.